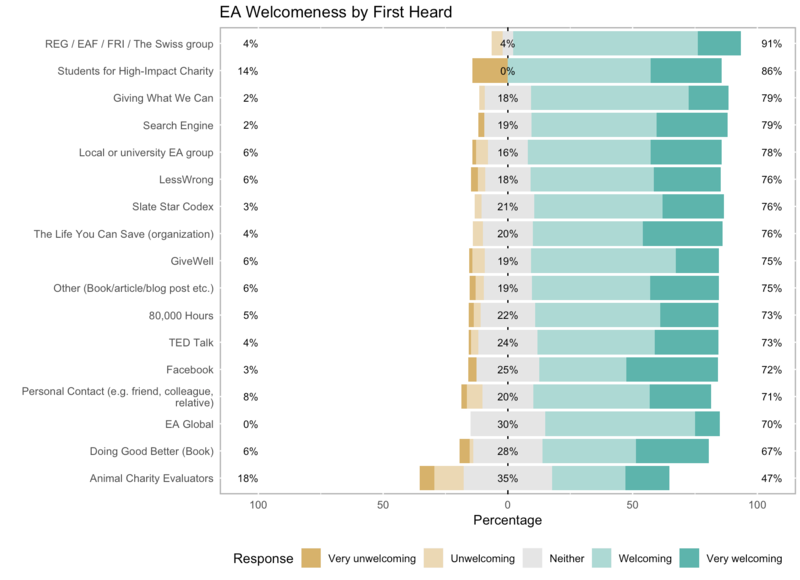 A majority of EAs feel that the EA movement is welcoming. New EAs rank the movement as more welcoming than long-time EAs. No statistically significant trends in welcomeness by race, education, or religion could be identified. In this post, we explore which EAs find the EA movement welcoming. Keeping the effective altruist movement welcoming is a guiding principle for many EAs. 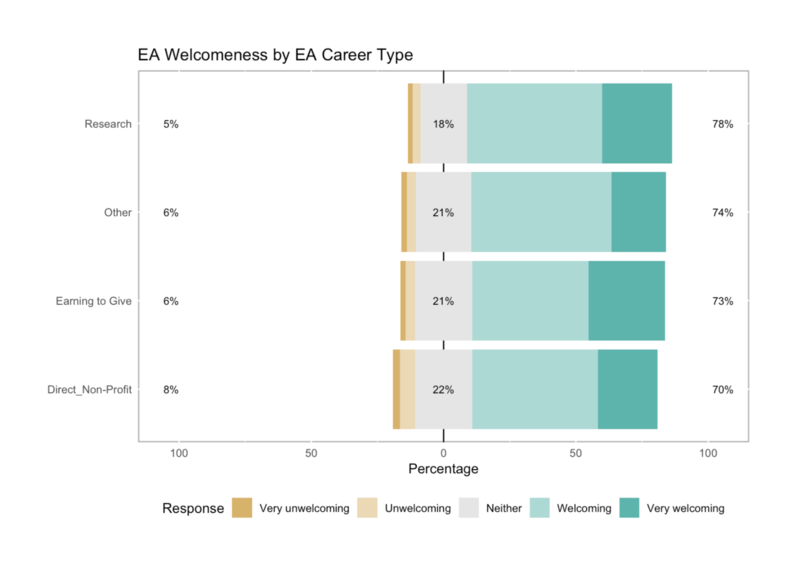 The EA Survey allows us to see how EAs responded to the question of how welcoming is EA on a 5-point scale from “Very Unwelcoming” to “Very Welcoming”. A majority of respondents in the survey find the EA movement welcoming or very welcoming. This may not be very surprising since this is from a sample of people who identify as EAs and are engaged enough to take the survey. 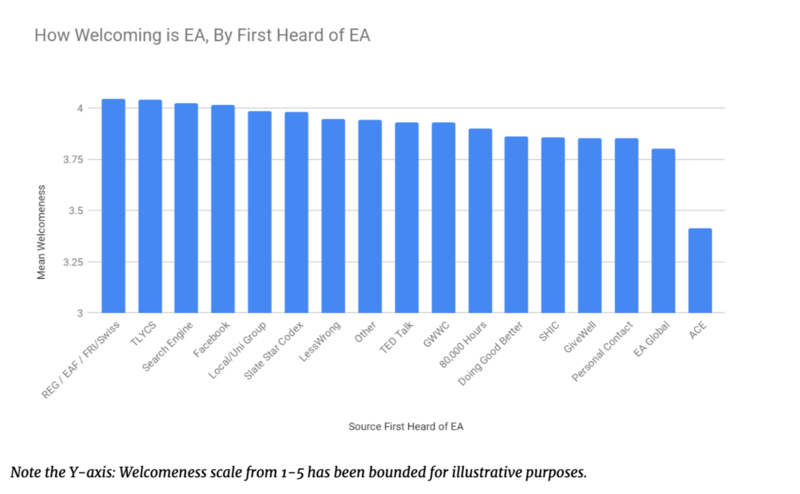 On the margins are a small percentage (6%) of EAs who believe EA is unwelcoming, and slightly more than a quarter of EAs who find the movement very welcoming. N.B. images can be viewed in full size if opened in a new tab. Note the Y-axis: Welcomeness scale from 1-5(very unwelcoming to very welcoming) has been bounded for illustrative purposes. 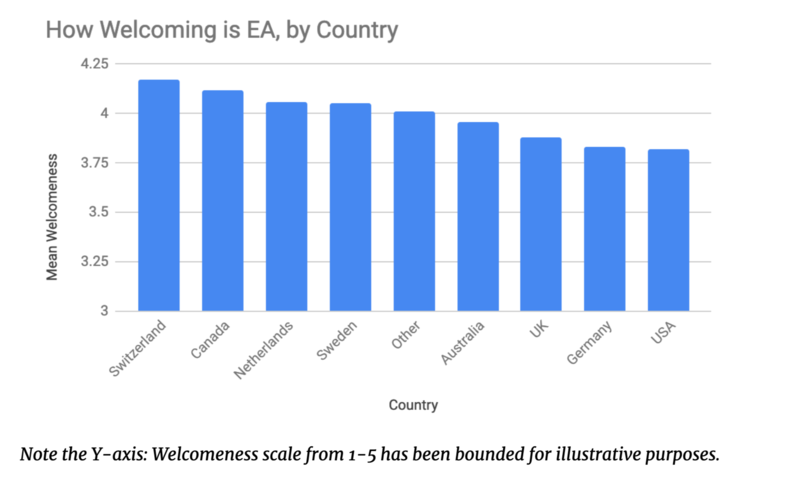 Ratings of how welcoming EA is are higher among EAs that joined more recently. As there were far fewer EAs in the survey who had heard of EA before 2013, grouping these cohorts more evenly shows a linear trend. Those EAs that joined many years ago and are still part of the movement are less likely to say it is very welcoming than those who have only recently joined. A Kruskal-Wallis H test showed that there was a statistically significant difference in welcomeness between the year groups, χ2(2) = 29.295, p = 0.0001), suggesting a difference between at least two of the groups, but we cannot know from this test which groups. 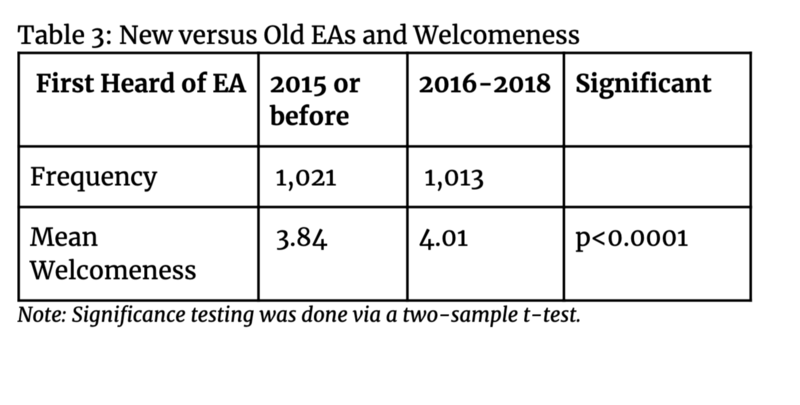 Separating EAs into just two roughly even groups by year of joining, we see a significant difference in the mean welcomeness score between those who joined in 2015 or before, and those who joined from 2016-2018. Of course, from this we cannot infer that the movement was any more or less welcoming in the past when these EAs joined. The youngest group of EAs (18-22) appear to have a higher mean welcomeness score, compared to older EAs. The differences between age groups stem from the youngest cohort being more likely to rate EA as “very welcoming” than other groups, but older groups being more likely to rate EA as only “welcoming” rather than more of them rating it as “unwelcoming”. The 35+ cohort is more likely than the others to be neutral on the issue. A Kruskal-Wallis H test showed that there was a statistically significant difference in welcomeness between the age groups, χ2(2) = 18.002, p = 0.0012, suggesting a difference between at least two of the groups. As we noted elsewhere, the changing age demographics of the movement are likely driven by survey respondents who are already in the effective altruism movement aging, rather than older people joining effective altruism. So based on the above time-in-EA effect, we would expect older EAs to view the movement as less welcoming if they are also veteran EAs. Among recent EAs there are no significant differences in the mean welcomeness score between the age groups ( Kruskal-Wallis H test χ2(2) = 4.744, p = 0.3145). However, among EAs from earlier years there appears to be greater variation, but no clear trends. This may suggest that being very new to EA has a strong positive effect that precludes the knowledge/experiences that are necessary for different age effects to take place. Those EAs with a top priority cause of Meta Charities, AI Risk, and other Long-Term Future causes find EA more welcoming than those who prioritise other cause areas. A huge majority (92.67%) of the few respondents who prioritise Nuclear Security (n=17) find EA welcoming, but also are the least likely to be neutral. Those who prioritise Mental Health (n=28) were the least likely to find EA very welcoming and the most likely to find EA unwelcoming. A Kruskal-Wallis H test showed that there was a statistically significant difference in welcomeness between the Top Priority Cause groups, χ2(2) = 27.824, p =0.0019, suggesting a difference between at least two of the groups. This at first glance seems to run counter to the time-in-EA effect as those prioritising Meta Charities and AI Risk tend to be long-time EAs. However, those prioritising Animal Welfare or Global Poverty also tend to be long-time EAs but have lower welcomness scores, and those prioritising Nuclear Security are among the newest EAs and also see the movement as very welcoming. One might imagine the source from which one learns about EA to affect first impressions of welcomeness. More in-person types such as personal contact, local groups, or EA Global might be associated with higher welcomeness than more distant impersonal online sources like books, the EA Facebook page or the EA Forum. However, there is no apparent personal/online division. EAs that first heard of EA via REG/EAF/FRI/the Swiss group have the highest average welcomeness rating, followed closely by The Life You Can Save organisation. Those coming via Animal Charity Evaluators feel EA is the least welcoming. However, a Kruskal-Wallis H test showed that there was not a statistically significant difference in welcomeness between the First Heard groups, χ2(2) = 14.250, p = 0.7126. These differences are neither significant nor very substantial, with the exception of those hearing of EA via ACE which may reflect the lower priority of Animal Welfare/Rights in EA, the organisation’s involvement in both EA and traditional animal activist communities, and that this only comprises a small number of survey respondents (n=17). Swiss EAs have a high mean welcomeness score, in contrast to the low mean of neighbouring German EAs who are among the most likely to find the movement unwelcoming. EAs from the UK and USA, who make up a plurality of the movement, are very similar in how they view the welcomeness of EA. A Kruskal-Wallis H test showed that there was a statistically significant difference in welcomeness between the country groups, χ2(2) = 28.209, p =0.0004, suggesting a difference between at least two of the groups. There is no apparent trend between countries, average time-in-EA, and welcomeness. 22% of Berlin EAs see EA as unwelcoming or very unwelcoming compared to only 4% of Melbourne EAs. 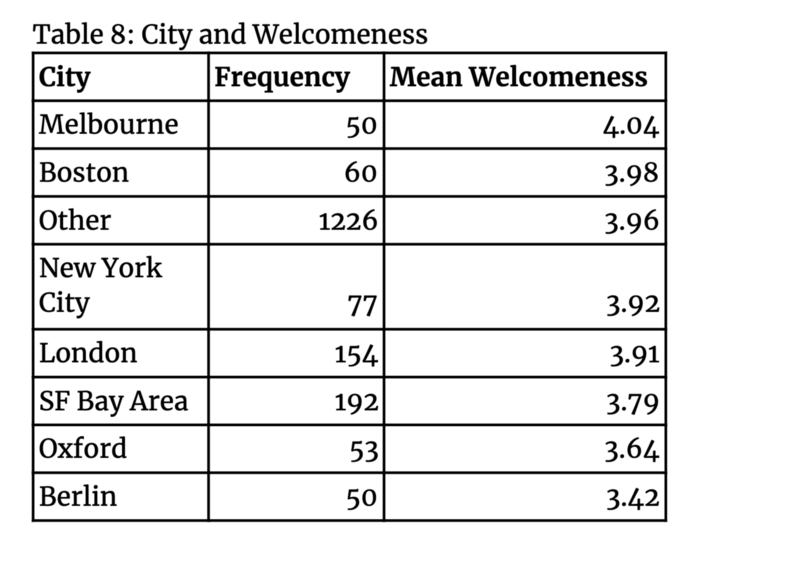 32% of Melbourne EAs view the movement as very welcoming. 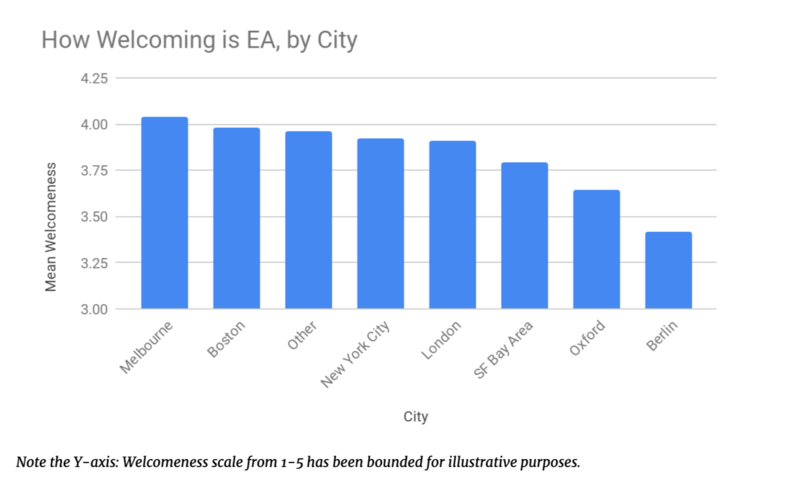 EAs in London and the San Francisco Bay Area, which are the most commonly reported locations, have relatively lower mean welcomeness ratings. A Kruskal-Wallis H test showed that there was a statistically significant difference in welcomeness between the city groups, χ2(2) = 24.185, p =0.0011, suggesting a difference between at least two of the groups. 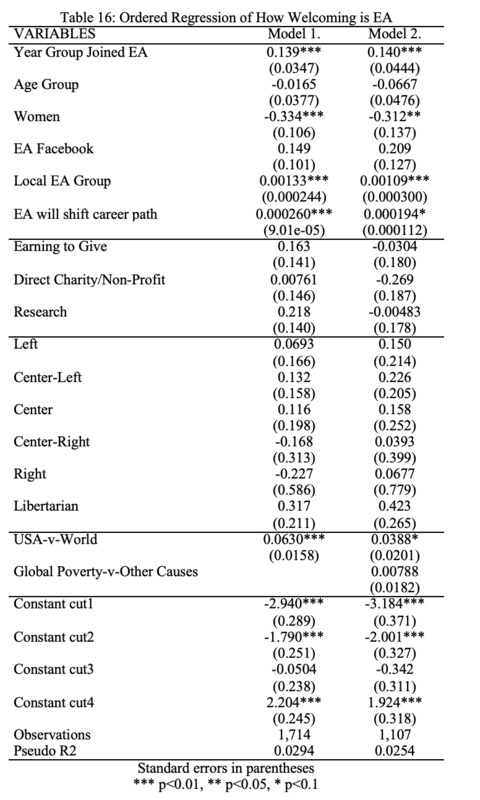 We have shown elsewhere that most effective altruists are on the left/center-left, and there is interest in how Effective Altruists can be welcoming to conservatives. 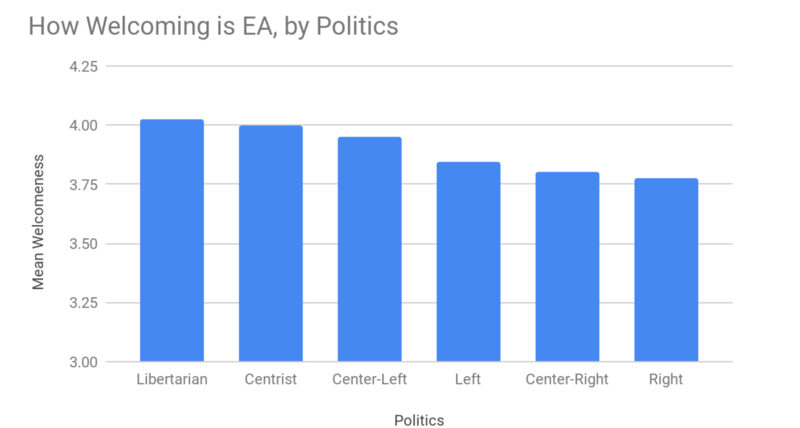 There are too few EAs on the “Right” (n=9) to say anything meaningful about how welcoming they rated EA, however, their absence in raw numbers from the survey is perhaps more telling. Almost no Libertarian EAs (0.65%) rate the movement as very unwelcoming, while 6.67% of those on the Center-Right and 9.06% of Left EAs rate the movement as unwelcoming or very unwelcoming. 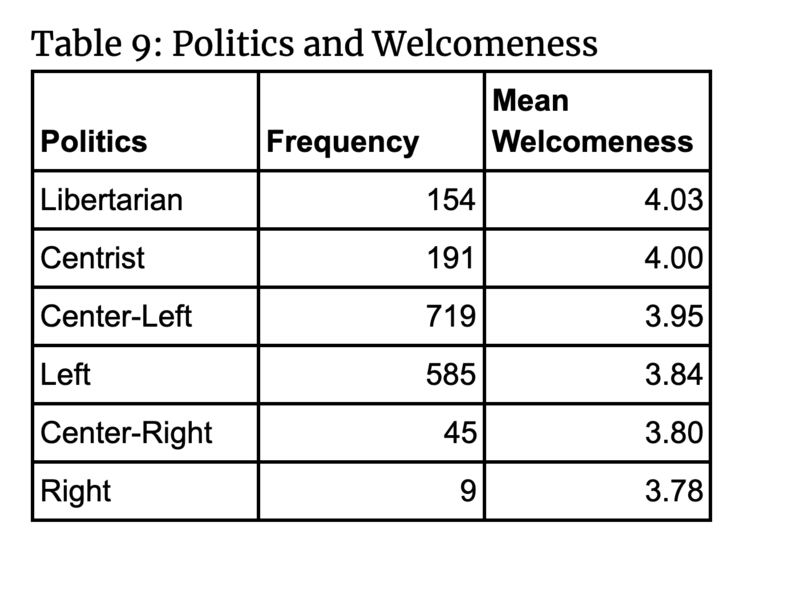 However, a Kruskal-Wallis H test showed that there was not a statistically significant difference in welcomeness between at least two of the politics groups, χ2(2) = 5.958, p =0.3103. 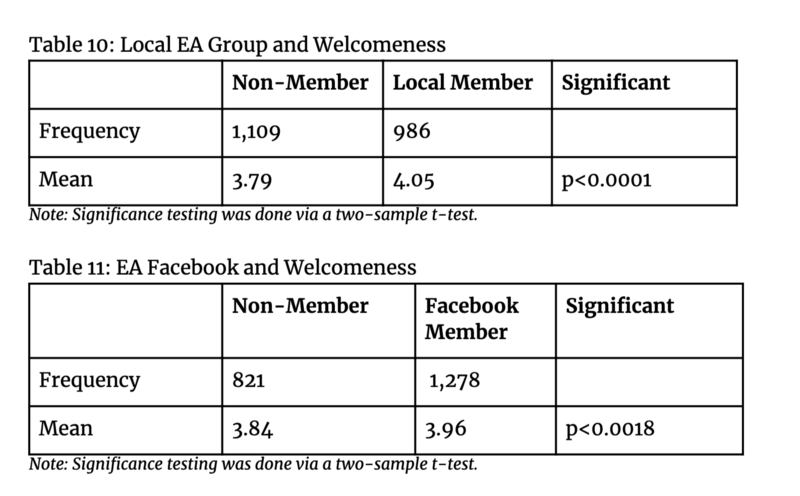 Members of local EA groups are significantly more likely to rate EA as welcoming than non-members, as are members of the EA Facebook page. There is not a significant difference between Facebook and non-Facebook members among Local Group members, though there is among non-local group members. Making EA groups more welcoming may then seem a useful way to keep the EA movement open. The membership involvement clusters we identified in a previous post show that the two groups (clusters 4 and 5) with 100% local group membership see EA as the most welcoming. This makes sense given the differences identified above. The uninvolved group (cluster 1) are unsurprisingly the least likely to view EA as welcoming. A Kruskal-Wallis H test showed that there was a statistically significant difference in welcomeness between the involvement groups, χ2(2) = 61.070, p =0.0001, suggesting a difference between at least two of the groups. Note the Y-axis: Welcomeness scale from 1-5 has been bounded for illustrative purposes. There appears to be evidence of a gender difference, with women ranking EA in 2018 as less welcoming on average than men do. This difference is statistically significant, however, it seems to stem mainly from more men rating EA as very welcoming, and more women being neutral, rather than substantial differences in the belief that EA is unwelcoming. The apparent difference may also partly stem from women being less likely to be involved across a wide range of dimensions in EA, leading to more neutral ratings. Regarding other demographic measures, there were no statistically significant trends in welcomeness by race, education or religion. This doesn’t mean that these trends don’t exist, just that we couldn’t identify them with the data that we have. Those respondents that indicated they expect to shift their career based on EA are more likely to view EA in 2018 as welcoming than those who don’t, however, there is no difference between those who have already changed career based on EA and those who haven’t. 8.40% of those in Direct Charity or Non-Profit jobs view the movement as unwelcoming or very unwelcoming, compared to ~5% for other career groups. Those in Research careers are the most likely to rate the movement as welcoming. A Kruskal-Wallis H test showed that there was a statistically significant difference in welcomeness between the career types, χ2(2) = 10.463, p = 0.0150, suggesting a difference between at least two of the groups. Using an ordered regression model, these predictors on the EA welcomeness scale only explained 2% to 3% of the variation. 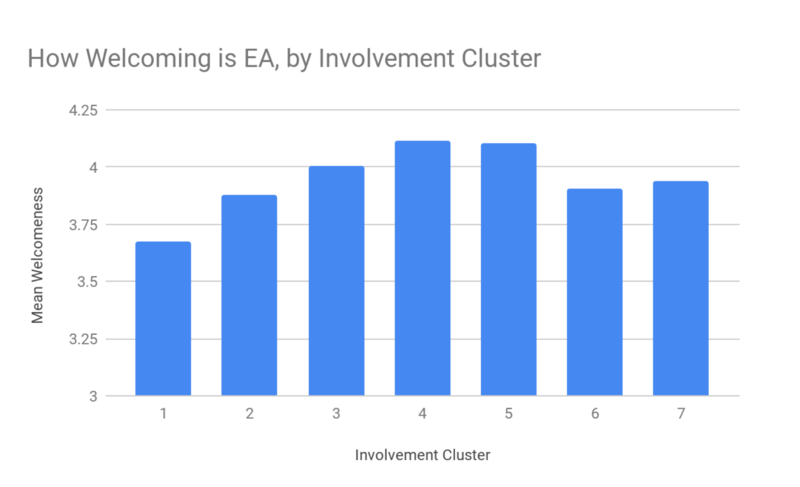 This means almost all of the differences in people's perceptions of the welcomeness of EA come from factors that aren't represented in the model or data we captured in the survey. A separate model with Top Priority cause was made due to the relatively large n of respondents who offered no or multiple top causes and were excluded. Overall, the effect sizes appear to be quite small and many of the significant group differences suggested above are not significant so appear to be confounded rather than true associations. 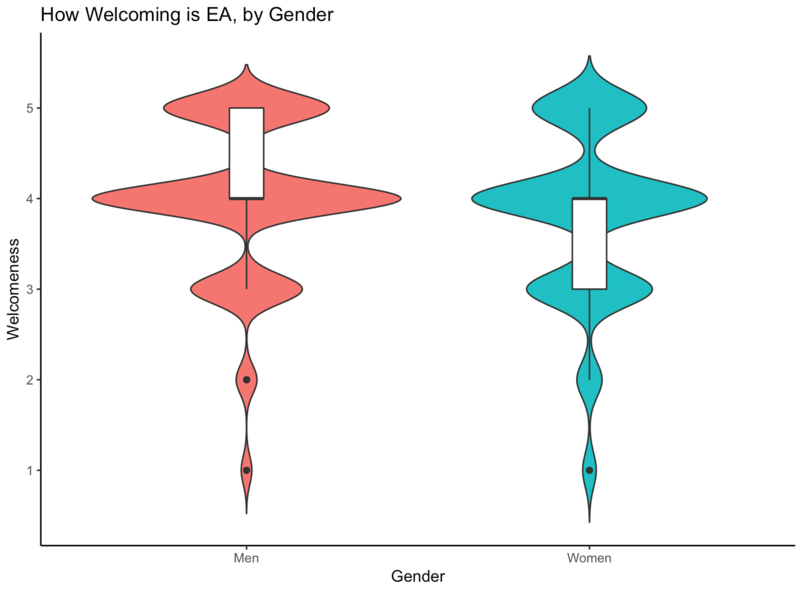 It suggests statistically significant increases in welcomeness among those who have joined EA more recently, are men, are Local EA Group members, or expect to shift their careers because of EA (though confounded by top priority cause it appears). Notably, age group is not significant. For reasons of space and simplicity, Country and Top Priority Cause are presented in the table below as the most popular response category (USA and Global Poverty) in comparison to all others. To view a regression table with the categories demarcated, click here. In Models 3 and 4, there are no significant differences between any single top priority cause when each is compared to all the others combined. Similarly, while the USA and Germany appear significantly different when each are compared to the combined other countries, this is not significant once top priority cause is controlled for. However, in Model 6 there is a significant (p<0.05) positive difference in welcomeness between AI Risk and Global Poverty, and between Meta Charities and Global Poverty. One issue when interpreting these results is that there is a strong potential for our findings to be undermined by selection bias. We can only collect data from those people we can see - those who find the EA community so unwelcoming that they do not fill out the EA Survey at all will not be included in our results and we thus cannot learn from them. This could mean that we miss important trends that would be noticed if we somehow had a sample that was perfectly representative of all current and prior EAs. 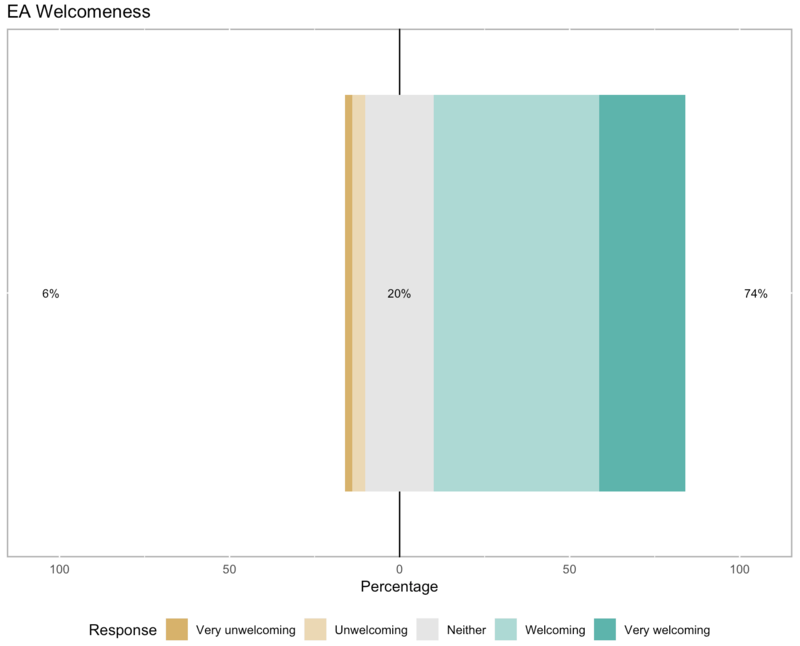 Measuring the EA-related sentiment among potential EAs and/or people who left EA was unfortunately impossible with the main survey and would require actively reaching out to these highly dispersed groups. Therefore, we cannot here make claims about how welcoming the movement is to those outside it, and what policies might be best enacted to improve this. The relative low number of some groups or categories may be suggestive of this, but not definitive. Instead, we can offer insights into which groups are represented in EA, even if they haven’t found it very welcoming, and which groups feel especially welcome. Given the number of hypothesis tests we do in this piece, we may run into problems of multiple comparisons, so it is also informative to do Bonferroni correction - that is count the number of hypothesis tests (both Kruskal-Wallis and T-tests) in the analysis and note whether any p-values significant at the p<0.05 level remain significant at the p<0.05/(N of tested hypotheses) level. We ran 17 such tests (including tests done but not included in this post), making our adjusted threshold p<.0029. Of all the results we found here, only the finding of welcomeness by career type becomes statistically insignificant under this more stringent criterion. The vast majority of EAs feel that the movement is welcoming and the continued growth of the movement is a positive sign. Welcomeness-related differences between various groups tend to be minor, so no major cluster appears to be substantially excluded in comparison with the baseline rating. However, we do not have confident estimates of attrition rates from the data available here to discuss any selection or survivorship bias. Among those still in the movement, we can discern some differences in terms of welcomeness ratings. EAs in local groups, in particular, view the movement as more welcoming than those not in local groups, though there are also potential selection effects at work here. That EAs who have been around the longest tend to view the movement as less welcoming is interesting, as it may suggest the initial positive bump in welcomeness ratings among new EAs could subside once they learn or experience more and give way to the other differences highlighted here. Upon helpful feedback from Greg Lewis, initially presented chi-squared tests have been replaced with Kruskal-Wallis Test results. We have also added a discussion of Selection Bias and adjustment for multiple comparisons. Text was added to offer more discussion of selection bias, regression design, and issues of multiple comparisons. We had previously concluded that “EAs prioritising Meta Charities, and Long-Term Future causes are more likely to find EA welcoming.” Upon further reflection on feedback from Greg, we have decided to no longer emphasize this conclusion. In fact, we can only conclude that EAs prioritising Meta Charities, and Reducing Risks from AI are more likely to find EA welcoming relative to EAs prioritising Global Poverty. This still seems important as a plurality of EAs rank Global Poverty as their top cause, but the previous phrasing was not accurate. This post was written and with analysis by Neil Dullaghan, with contributions from David Moss. Thanks to Peter Hurford, Luisa Rodriguez, and Marcin Kowrygo for comment and Kim Cuddington for data visualisation assistance.